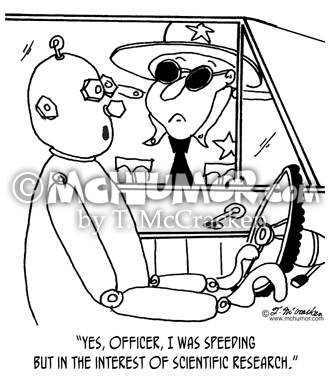 Safety Cartoon 5120: Crash dummy saying to a highway patrolman, "Yes, officer, I was speeding, but in the interest of scientific research." 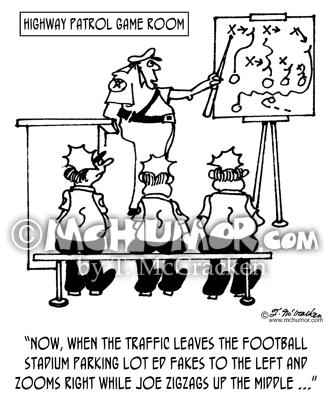 Accident Cartoon 8755: "Fred didn't understand why he was being given a ticket when he did technically stop." 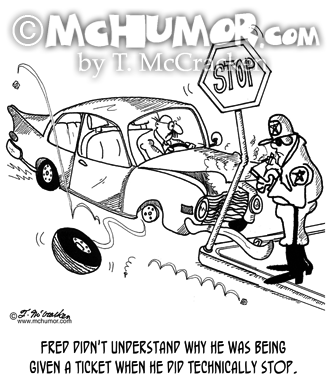 A police officer writes a ticket for man whose car has crashed into a stop sign. 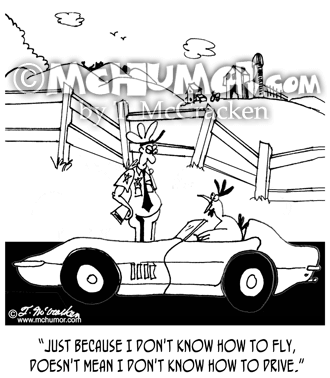 Vacation Cartoon 6691: A highway patrolman looking at a car says, "A family car trip." Kids yelling, "I have to go to the bathroom," "Are we there yet?" 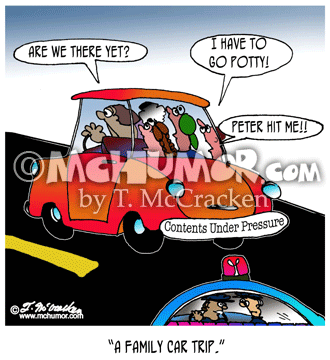 and Peter hit me. 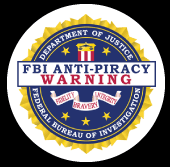 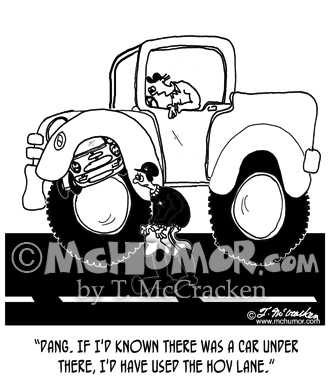 A bumper sticker says, "Contents Under Pressure." 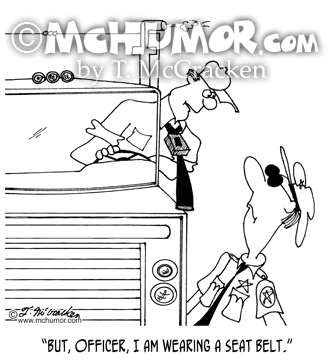 Truck Cartoon 4214: A trucker wearing a seat belt as if it were a necktie says, “But, officer, I AM wearing a seat belt." 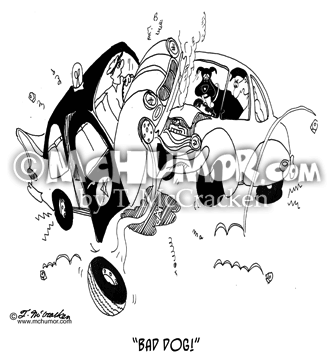 Accident Cartoon 7783: After a dog driving a car crashes into a police-car, his master says, "Bad dog!" 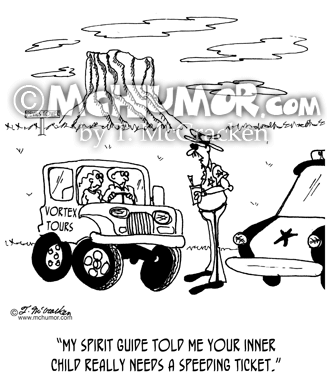 Police Cartoon 6786: A highway patrolman who pulls over a jeep from "Vortex Tours" in front of the Devil's Tower says, "My spirit guide told me your inner child really needs a speeding ticket." 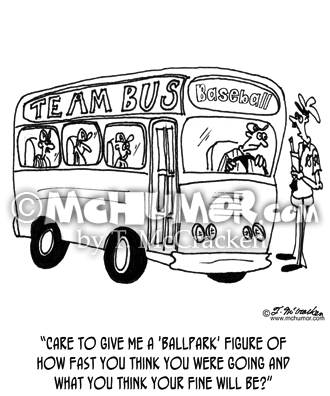 Baseball Cartoon 6481: A highway patrolman who's stopped a baseball team's bus says to the driver, "Care to give me a 'ballpark' figure of how fast you think you were going and what you think your fine will be?"